Sunday was a day of comedy for me. First I saw one of the most beloved comedies of American theater - The Odd Couple - in an excellent production at Lyric Arts. 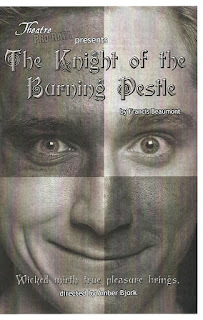 Then I traveled from the 1960s back to the 1600s with Theatre Pro Rata's Knight of the Burning Pestle, the first parody in English theater. This play-within-a-play is a spoof of theater itself, and the cast has great fun with it. And while I didn't always understand the specifics of what was going on (I sometimes have a hard time with Shakespearean era language), that didn't seem to matter. The enjoyment comes in watching the delightfully campy performances of the eight-person cast as they poke gentle fun at the thing we all love best -theater. A production of The London Merchant is about to begin when it is interrupted by a grocer and his wife, who demand that their apprentice Rafe be given a role in the play. They proceed to sit to the side and exhibit every bad audience behavior known to theater, from loudly unwrapping candy to falling asleep to interrupting the play to make suggestions (well almost all - they didn't have cell phones). The play continues with fights and love stories as such things do, and the cast of the play-within-a-play just tries to get through it. Under the direction of Amber Bjork, everyone in the cast completely commits to the fun, light-hearted, and campy tone of the show. As the grocer and his wife, Ben Tallen and Rachel Flynn are quite hilarious to watch. 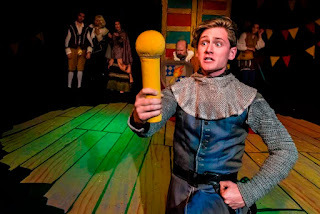 George Dornbach as Rafe is delightfully earnest, with some expressive hair-flipping. The London Merchant cast includes David Schlosser, Grant Henderson, Julie Ann Nevil, Andrew Troth, and Becca Hart, stealing scenes as she plays increasingly more ridiculous toy instruments, from a recorder to an accordion to a tiny grand piano. St. Paul's Dreamland Arts is a tiny space that really allows the audience to feel part of the action. Gabriel Gomez's scenic design provides a colorful carnival atmosphere, with most of the prop pieces coming out of a versatile wardrobe with many doors and drawers. Mandi Johnson's costumes set us squarely in Elizabethan times with corsets and codpieces alike. This is much lighter fare that the dark and complex plays usually seen at Theatre Pro Rata. And as much as I love dark and complex, it's fun to see them let loose and be silly for a change. Knight of the Burning Pestle is quite silly indeed, and delightfully so (continuing through June 19).